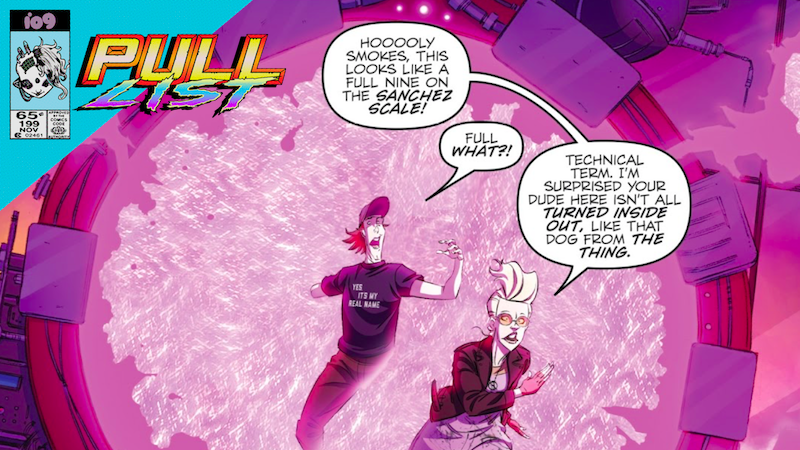 Ron Alexander of the Chicago Ghostbusters and Jillian Holtzmann running through an interdimensional portal. One of the greatest things about comic books is that they can (and often do) tell stories about updated versions of classic teams we’re all familiar with, and at a much more rapid pace than you’d see in television or movies. As a result, comic teams change rosters almost as quickly as individual team members change costumes, something this week’s very best new comics understand and take advantage of in the very best ways. The New Mutants back in action. In the time since the New Mutants first made their debut as a team 35 years ago, its members have gone their separate ways, becoming so much more than just Xavier’s spandex-clad students. Though The New Mutants: Dead Souls doesn’t bring back all of the original members as regulars, the title picks up with Magik and Wolfsbane bartering with Rictor, Boom-Boom, and Strong Guy to work for Karma as a team of mutant paranormal investigators. Chrysalis and her good friend . The near-endless cycle of deaths, resurrections, cancellations, and reboots in comics is what makes it possible for our favorite comic book characters to keep coming back better, newer, and yet still familiar to us. Eternity Girl is a metafictional reboot of sorts that draws inspiration for its titular character from other characters under the larger umbrella of DC’s pantheon of heroes, like Endless Girl and Doctor Manhattan. When we meet Caroline Sharp, she’s both literally and metaphorically pulling herself back together after realizing during the DC and Young Animal’s Milk Wars event that her entire fictional history detailed in comics is just that—made-up stories about a person who doesn’t really exist. Holzmann and Alexander on their way to bust some ghosts. Despite what some angry fanboys might tell you, the Ghostbusters franchise is larger than the cast members of the original movie. Ghostbusting is a way of life embraced by a broad range of brilliant kooks and paranormal investigators spread across a multimedia universe, and a handful of them all come together in IDW’s Ghostbusters: Crossing Over. Thanks to the use of a newly-developed inter-dimensional gateway technology that would make Rick Sanchez proud, Jillian Holtzmann’s gotten into the habit of hanging out with the Prime Ghostbusters and the Ghost Smashers, a rival team of investigators who have specialized specifically in the destruction of ghosts. With all of the Ghost-enthusiasts researching new and dangerous ways to harness psychokinetic energy through different applications, their experiments unsurprisingly draw the attention of both the dead and the living who fear what new horrors they might accidentally unleash upon the world.